Hope's Cafe: Get Quality Scrubs from Blue Sky Scrubs!! I am not a nurse, or in the medical field at all; but I do love wearing scrub tops around the house. 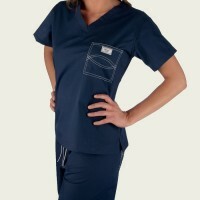 They are so comfortable, and the perfect top for lazy days at the house (not that I have many of those :) I recently heard about Blue Sky Scrubs, and they look to have a great selection of high quality scrubs. On Blue Sky Scrubs you can shop by color, style, by top, bottom or set, or even make your own custom scrubs! You can find scrubs for men, or women's scrubs and choose original, simple or urban style. If you want a cool, comfortable outfit for these heat-drenched summer days, I recommend you check out http://www.blueskyscrubs.com/ you just might find something you like! I wrote this post for Blogsvertise and Blue Sky Scrubs. All thoughts and opinions are mine; I have not purchased or received product from Blue Sky Scrubs. There are some great-looking scrubs out there! AND I hear they are really cool to wear in the summer time. Thanks!